Three-Rung Ladderback Chairs With An 18" Seat Height Are Sturdy And Comfortable With Curved Back Legs To Help Reduce Tipping. Ladderback Design Makes Chairs Easy To Pick Up And Move. Leg Rails Along All Four Sides Add Strength And Stability. Assembled Chairs Are Made Of Solid Hardwood And Feature Mortise And Tenon Construction. They Are Recommended For Adults And Children From 12 Years Old And Up..
Three-Rung Ladderback Chairs With An 18" Seat Height Are Sturdy And Comfortable With Curved Back Legs To Help Reduce Tipping. Ladderback Design Makes Chairs Easy To Pick Up And Move. Leg Rails Along All Four Sides Add Strength And Stability. 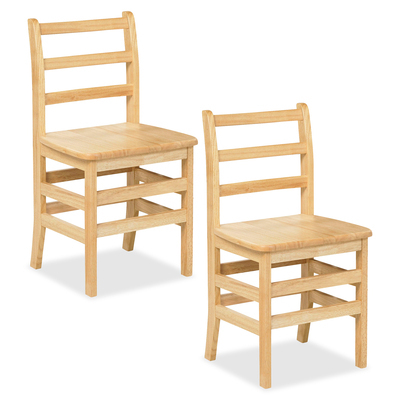 Assembled Chairs Are Made Of Solid Hardwood And Feature Mortise And Tenon Construction. They Are Recommended For Adults And Children From 12 Years Old And Up.